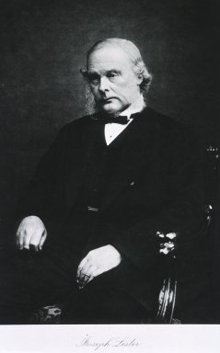 Baron Joseph Lister (1827-1912), who discovered the importance of antiseptic procedures in surgery. Before his innovative work, infections were believed to be caused by airborne agents — "bad air." Surgeons were not required to wash hands or instruments between patients. Meanwhile, midwives, who at the time did wash hands and instruments, had been experiencing infant mortality rates much lower than surgeons. This fact went unexplained until Lister's work. Photo courtesy U.S. National Institutes of Health, from a collection entitled Images from the History of Medicine in the U.S. National Library of Medicine. On October 14, 2011, the Apple iPhone 4S first became available for sale. Lines formed at Apple stores around the world, and pre-release sales of a million units broke all records for mobile phones. Though no buyers had yet seen it, they felt that the new phone was a welcome change. On September 21, 1867, the British Medical Journal published a pioneering paper entitled, "On the Antiseptic Principle in the Practice of Surgery," by British surgeon Joseph Lister (1827-1912), in which he advocated sterilization of instruments to prevent infection following surgery. His methods were rapidly adopted throughout Britain. Not so in the United States. The failure of the U.S. medical community to embrace the changes Lister advocated was most unfortunate for President James Garfield, who, on July 2, 1881, was the victim of an assassination attempt in which two bullets struck him. Efforts by surgeons to trace one of the bullets, using their unwashed fingers and unsterilized instruments, led to massive infections. Garfield finally succumbed to a heart attack on September 19. One change was overwhelmingly welcomed; the other shunned. Why? It's an important question, because our assessments of the net value of changes can be most unreliable. Here's Part I of a catalog of factors that can distort our assessment of changes. All change involves both losses and gains, but between them there is a fundamental asymmetry. When we experience a loss, it's usually a loss of something we know well. When we experience a gain, it's usually a gain of something we don't yet fully appreciate. Because we don't have it, it's difficult to understand the full scope of its benefits. Like all circumstances, the full circumstances of the new status quo are complex. Until we fully adapt to the change, we tend to understand our losses more easily than our gains. That's one reason why our assessment of the net value of a coming change can tend to bias us against it. fundamental asymmetrysimple. Whether by design or by happenstance, these changes seem to be minor, or they promise to simplify dramatically some parts of our lives. We tend to welcome these changes even before we understand their full implications. The error we make here is confusing the change, which seems simple, with the circumstances surrounding the change, which are always complex. This error is responsible for many of the mishaps we call unintended consequences. For most systems, which are far more complex than we appreciate, changing one element can ripple through the system in ways we can understand only after the system demonstrates them to us. Even though the U.S. medical community spurned Lister's methods, some were convinced. In 1879, Listerine was first formulated. At the time, it was intended as a solution for sterilizing surgical instruments. For more about Joseph Lister, see his biography in Wikipedia. See Wikipedia also for more about Listerine. For the story of James Garfield, see the new book by Candice Millard: Destiny of the Republic: A Tale of Madness, Medicine and the Murder of a President. Would you like to see your comments posted here? rbrentLpevjBNLTzZHGaXner@ChacbpdLafbqzJiHeBjooCanyon.comSend me your comments by email, or by Web form. See also Organizational Change and Emotions at Work for more related articles. I offer email and telephone coaching at both corporate and individual rates. Contact Rick for details at rbrenjSZBGPKdqRGOXGVTner@ChacwBertyDeXFrEEjsooCanyon.com or (650) 787-6475, or toll-free in the continental US at (866) 378-5470.